FIRST BANDS ANNOUNCED, EARLY-BIRD-TICKETS RUNNING SHORT & MERCHANDISE AVAILABLE NOW! Summertime is festivaltime – gregarious mood, exciting music, and the delightful feeling of simply allowing your soul to take a trip down recreation lane. The more we´re happy to rock Tanzbrunnen Cologne with you again on 22. & 23.07.2017. Very fittingly we are to announce the first bands for Amphi Festival 2017 today. Meanwhile pre-sale already runs at full blast. Our limited EARLY-BIRD-TICKETS for a reduced early booking price of 65,00 € (plus pre-sale charge) are exclusively available at the Amphi Shop at www.amphi-shop.de, plus they´re already short in stock! If you wish to secure one of these highly requested tickets you should order rather quickly. Also available at Amphi Shop now: our 2016 Amphi-merch with t-shirts, hoodies, etc. at http://www.amphi-shop.de/highlights/...amphi2016.html. This offer also stands while stock lasts. The Amphi Festival opening event CALL THE SHIP TO PORT is a phenomenon! Brought to life first in 2013, we return to the MS RHEINENERGIE again in 2017 for another exclusive extravaganza, when the epic Rhine panorama unites with massive beats, forming a symphony of images, sounds and emotions. Either for the rhythm of the music or the sundown on deck - CALL THE SHIP TO PORT is a special experience, sharing its fascination with anyone who once stepped aboard the unique European event catamaran. Tickets are available exclusively at Amphi Ticketshop www.amphi-shop.de while stock lasts. Upgrades are only available for visitors who already ordered or own a 2017 weekend ticket. Shipment of the tickets begins at the end of November. After being repeatedly asked whether to offer CALL THE SHIP-tickets without the box set, this time we actually concluded to pass on the premium-boxes, allowing us to offer CALL THE SHIP TO PORT at a much cheaper ticket price. The additional price for Friday with CALL THE SHIP TO PORT is now only 49,00 € instead of 63,95 € (each plus 5,00 € pre-selling charge). 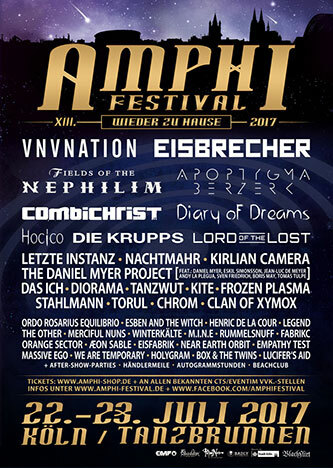 In featuring EISBRECHER we present you Amphi Festival’s second headliner of 2017. The Schock assimilated, the prototype assembled, it seems hell still has to wait a little longer. Ready to embark on the next storm voyage, captain Alex Wesselsky and Noel Pix give the call for a rapid foray, full speed ahead! Gladly the rockers from the beautiful ice state of Bavaria are a little crazy, so they don’t miss to celebrate the iceless summertime with a blasting festival show at Tanzbrunnen Cologne. Multitalented and versatile, we are very much looking forward to the interdisciplinary Norwegians APOPTYGMA BERZERK. Long established beyond the borders of the electronic music scene, always in for a good surprise, the chartstormers around Stephan Groth serve finest alternative pop with rocking electronic edge – gripping to very final note. Also you may look forward to the elegant and epic synth sound of Italian-based cult formation KIRLIAN CAMERA, lead by singer Elena Alice Fossi and mastermind Angelo Bergamini. Literally risen from the dead, DAS ICH are an undisputed highlight of any scene festival. An undemolishable rough-edged classic, you can’t help treasuring, if not loving for every given song. Over 30 years of gothic history unified in the personas of Stefan Ackermann and Bruno Kramm. Speaking of resurrection: rising again, though a little more „the living dead“-way, always played a pivotal role in the works of horrorpunk masterclass graduates THE OTHER. Zombies, ghouls and other monsters come to undead life as Lord Usher and his flock set-off for a crazy creature-boogie. Do not miss out on the boppy electropop of CHROM, who of course bring some of their new 2016-released album „Peak & Decay“ along, as well as the Swedish wavepop-sorcerer and darling of the public HENRIC DE LA COUR. The charismatic artist from Stockholm returns to Amphi with fresh material in the trunk – well worth getting psyched about. Again from Sweden, ORDO ROSARIUS EQUILIBRIO expand the current Amphi line-up in the field of dark folk/industrial. Completely unfolkish, yet all the more industrial, also Calle Nilsson (yet another Swede!) heads for Cologne with his electronic thunderstorm called LUCIFER’S AID. Inspired by the icy soundscapes of Belgian minimal industrial, the one man army delivers some serious artillery, ready to blow your minds away. The debut album „New To Reality“ already belongs to the toughest contenders for the machine bulwark of the year. Cold, sinister and unforgiving! Following the motto „powerful music lends powerful arms“, in RUMMELSNUFF we got us an extra-strong seaman for the Amphi ship, throwing himself into the sweeps of the MS RheinEnergie at our Orbit Stage. The latter also goes for New York based sound-explorer Mark Roberts, who will give his Amphi first in shape of the ambitioned dark-electro project WE ARE TEMPORARY. Concluding today’s massive line-up we give you another delicacy for fans of the classic EBM boot. Hanover based cult-machinists ORANGE SECTOR celebrate their 25th anniversary next year and they chose their first ever Amphi gig for what shall become one hell of a jubilee, you can’t afford to miss. For further info please visit www.amphi-festival.de or www.facebook.com/amphifestival . Original Amphi Festival weekend tickets are exclusively available at Amphi Shop, www.amphi-shop.de ! Furthermore festival tickets are available at all nationwide CTS/EVENTIM box-offices, online at www.eventim.de, www.oeticket.com, www.ticketcorner.ch, www.eventim.nl and as PRINT@HOME edition. HAPPY EASTER! AMPHI SHOP DROPS DELIVERY CHARGES! all is Amphi, as is Easter! From Holy Thursday, 13.04., 0:01 am till Tuesday, 18.04., 12:00 pm we give you another opportunity to purchase without delivery charges. Concert- & festival tickets are likewise available as the various merchandise items. Even the exclusive Amphi opening CALL THE SHIP TO PORT, tickets for the official Amphi pre-party or the just starting E-tropolis 2018 tickets are part of this offer, to be found only at www.amphi-shop.de ! We wish you all Happy Easter and look forward to rocking Tanzbrunnen with you again soon. Merely little more than three months left until we finally meet again!